Researchers at the University of Miami (UM) Rosenstiel School of Marine & Atmospheric science have developed a new tool that will help monitor coral reef vital signs. Chris Langdon and colleagues can now accurately measure corals’ “biological pulse” and evaluate how ecological threats can impact the world’s reefs. 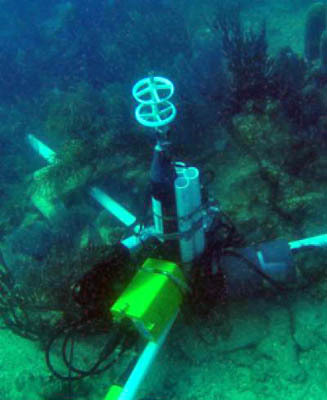 Back in 2009, the UM team first measured changes in dissolved oxygen in an enclosed chamber above the reef with one that measures the flux of dissolved oxygen above an unconfined portion of the sea floor. By measuring and comparing levels of dissolved oxygen and consumptions rates, Landgon and his colleagues were able to monitor the delicate balance between production of new organic matter by corals and algae, vs the consumption of organic matter by the reef’s heterotrophs. This allowed the team to assess the overall health of the reef. It will be interesting to see how this gets applied to evaluating reefs around the world during times when they are threatened by human and ecological disturbances.